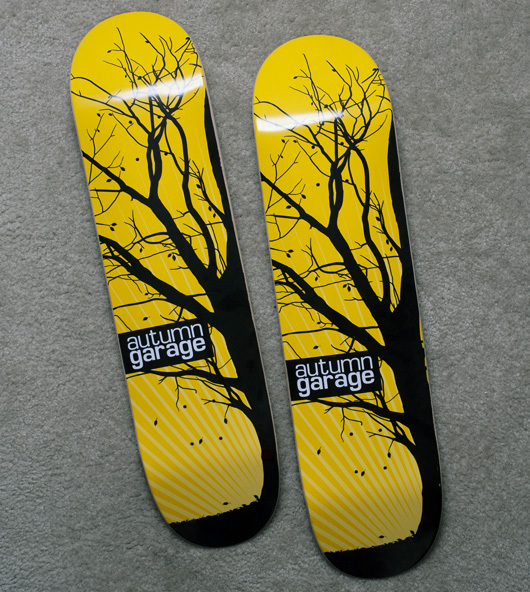 Autumn Garage Skate Decks Giveaway | Shelby White - The blog of artist, visual designer and entrepreneur Shelby White. 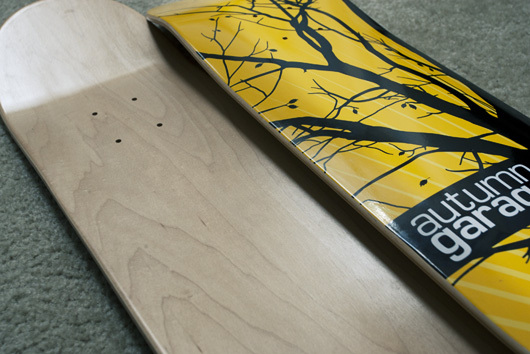 Up for grabs in the first Wanken giveaway are two skateboard decks that I designed for a company out of Salt Lake City. Sadly the company is no longer in business and I believe these decks are some of the very last ones left. The size of the first is 7.75″ and the second is 8.00″. To enter, just comment on this post and leave your name and email address in the respective comment form fields. The two winners will be drawn randomly on Monday, August 9th, 2010. If you are a winner I’ll contact you to let you know, so hurry and get your entry in! If you wouldn’t mind, share this link with your friends. I’m planning more giveaways for the future so keep stay connected through RSS or twitter. Count me in, I’d like to have one. Awesome work! Looks great! I love the detail. Any one who loves skateboarding needs to see the film: “Lords of Dogtown”. A documentary style film on how Skating started. And please watch a short film series by AARON ROSE titled “D.I.Y. AMERICA“. Basically an extension of the previous Beautiful Losers film & traveling art show, the shorts further examine the fertile artistic culture of skateboarding and the influence its had on modern underground visual culture, with additional feature episodes on Os Gemeos and Swoon. Yea Dogtown is epic. Also check out the dogtown and z-boys doco. Additionally, Writer/Director Larry Clark is heavily influenced by the subversive skating culture and has made some fairly controversial films, one of which being one of my favourite films Ken Park. Wazzup rockers delves deeper into skating but be prepared for some very strange but very cool film making. One of these would look killer next to the original Powell Peralta Caballero hanging in my office. Count me in! Mine would most def go on a wall as well, although I might slowly give in to temptation to take it out. Looking good. Would be great to wear out one of them! These skateboards look sick! Great job on them! Count me in. Those are beautiful! Good work. Awesome designs, I’d love to snag one. Enter me in! beautiful work i love this! Nice deck Shelby. Count me in. Amazing design and work. Would love to win one. Those are some great looking decks! Count me in as well. Fantastic! I remember talking with you about doing snowboards while we were both still in high school. Looks great! Love to have one ! They look fantastic !!! Great work! i love boards with elements of nature printed on them. Looks really nice. Count me in! I love skateboards! Skateboarding is one of the best things that happened to me, kept me busy in high school and kept me in shape. I think I may just go out and skate today. Great deck! The elements design is nothing short of amazing. I’d love to own this board. Nice work, love me some skate decks…. I grew up skateboarding and have been meaning to get back into it……Here’s my chance. Nice design. If I was to win mine would go on my wall too. Nice high contrast graphic. Yellow & Black is so in! Looks great! Would love to win one. Nice Design! Hello kind sir. ha i do like this design. i love collecting small edition skate decks and hanging them on my wall!! Awesome design – how many did they produce? Dang Shelby! Super rad skateboard designs. I could really use a new board! I used to design skateboards too but it as back before I knew anything about design. Long time reader, first comment! Nice contrast; reminds me of a logo I did a while back. All over this. Definitely feeling the grey over yellow/black. It’s great to see some new names in here! @Lukas I’m not sure about the exact number of decks produced, but if I were to guestimate I would say 50 or less—really not many. looks pretty cool. i don’t know about that autumn garage logo though. just kinda bland. I’ve been playing a lot of Skate on my ps3 lately, this would be great to get back involved in skating. Great work man. Do you know how ridiculously gorgeous that black and yellow paint would look smeared on my pool coping!?! I’ll take the 8″ deck, thanks! Looks sick, im too old to ride but would definitely put it on wall. Great design! Unfortunately as a skateboarder, I couldnt hang it on a wall, specially since my latest deck isn’t in the best of shapes right now. It would certainly improve my skateboarding, and if I win I can make it eternal by sending you a flick of a nicely performed skate trick here in Rio de Janeiro, Brazil. so rad. Good job man! That’s a really nice graphic! That deck in 8.00 would be so rad! Would love one, nice graphic! Great design! I love skateboard design work. Love the designs and hope I win. They would look awesome in my new home office. Oh wow, these look fantastic. I’d seriously appreciate one of these. This deck is cool, but I really don’t need one. Good work though. So cool! They look amazing, congratulations! Great design, shame they aren’t in business anymore. Happy times & Donkey Sauce. It is almost sinful what would happen to those decks should I win them! My 12 year old snapped his board grinding on a concrete curb, and these last of their kind decks would NOT be packed and sold 20 years later to a collector – they will be used. The kid has some nice Tensor trucks and Spitfire wheels that would bolt right on! Within a few hours of their arrival … at least one of the boards would be flying down the sidewalks and streets in the neighborhood. Yeah, these are truly beautiful boards. I hope they find a home where they will TRULY be appreciated. I would probably get back into skating if I had a fresh deck! Well done man, they look good. I just moved into my own place, and am desperately in need of some objects to hang on those naked walls. Not saying I have anything against naked walls! This would look fresh on my dorm wall this fall, great design. Wow , the Glossy finishing looks dope. Seriously , amazing work. yes they look pretty awesome. ill take one. :) thank you. Lovin it bro. Good work. Awesome decks, I’ll have to be sure to keep checking back here =). dope. would love to hang in the apartment. This is realy something special. Very nice I like it. It’s been awhile since I’ve stood on the ol’ wheels, but these would be a good incentive to start again. Looks like I’m not the only one in need of a fresh deck. Want to break it in so bad! I loveeeee the Autumn FEELLLL! It’s about time, I feel like one of those decks belongs in my possession.